The start of the men’s distance race was timed to perfection… at least for the spectators. 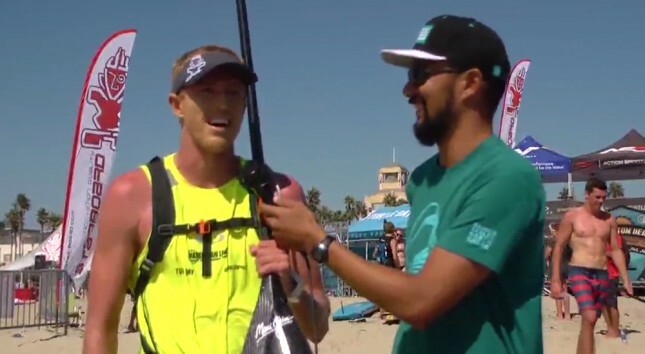 Results and recap from the racing half of the Huntington Beach Pro, which finished just moments ago. 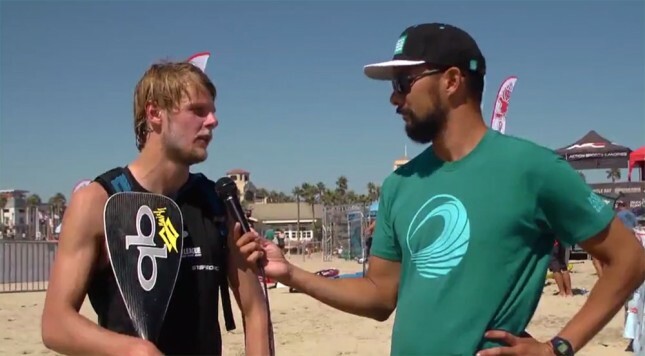 The event saw a very solid group of young stars hit Southern California for a serious warm-up ahead of the Battle of the Paddle. This event was the penultimate stop of the always dramatic (quite often for the wrong reasons) Stand Up World Series and, with the BOP just two weeks away, was a great chance to see who’s in form heading into the biggest race of the year. Conditions were tricky all weekend, with a solid little swell creating a punchy shore break on the south side of the HB pier. It was cool to see some powerful and determined performances from some very dedicated athletes, however the weekend belonged to Connor Baxter and Candice Appleby. The two made it a clean sweep of both the sprints (Saturday) and distance race (Sunday). Angie Jackson was the overall runner-up on the women’s side while Mo Freitas, Casper Steinfath and Jake Jensen gave Connor the most resistance in the men’s event. Connor’s victory in the distance race today not only gave him the overall event title, it also handed him the 2014 Stand Up World Series crown, wrapping up the title with one event left to spare. Congratulations Connor Baxter for winning the race, the event and the World Series title today. Results, recap and pics below. Congrats to all the guys and girls for paddling hard and cheers to Rocky Canon and Dave Boehne for the accurate webcast commentary. FIRST LAP: At the end of the first lap, seven guys opened up a lead: Jake and Connor had a slight gap to Casper, Kai, Kody, Zane and Mo, with another gap back to Bicho Jimenez, Noa Ginella, Josh Riccio, Fernando Stalla, Eric Terrien. SECOND LAP: On the second lap, Kai and Casper tried hard to close the gap on Connor and Jake but the two front runners were hard upwind to hold their advantage. Conditions looked tricky with slight sidewind / slight downwind / slight headwind, mixed in with a very punchy little shorebreak at the end of each lap. Connor and Jake traded the lead as they headed towards the end of lap two. Mo and Zane caught back up to Casper and Kai to make it a four way chase pack, with the Danish Viking dragging the group upwind. Casper pulled away towards the end of the second lap to hit the halfway mark of the five-lap race in a clear third. THIRD LAP: Connor broke Jake towards the end of the third lap to claim a clear lead. Jake was still a good ways ahead of the chase pack, which was still being lead by Casper Steinfath. Mo Freitas and Kai Lenny rounded out the top five at this point. Behind them the field started to splinter as the distance and conditions began to drain competitors. By the end of the third lap, the Danish Viking had made a huge surge to break away from Kai and Mo. Casper caught right back up to Jake and set a clear top three: Connor, Jake, Casper. 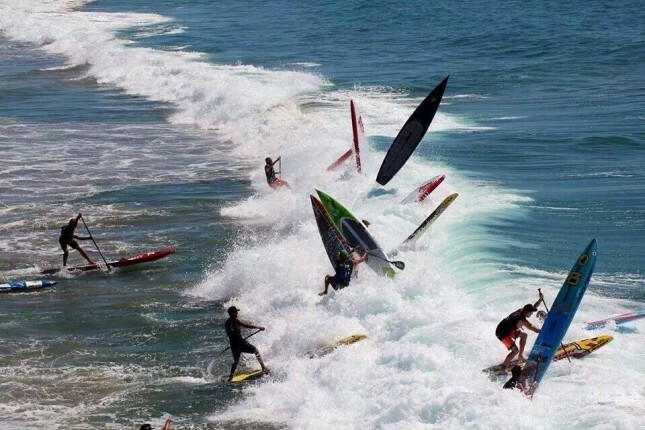 As the boys rounded the beach flag for the fourth and penultimate lap, Connor had about 20 seconds on Jake, with Casper taking a tumble in the shorey to be another 10-15 seconds back in third. Mo was sitting in fourth place ahead of Zane, with Kai Lenny starting to tire and dropping right back. Bicho Jimenez, Fernando Stalla, Kody Kerbox and Noa Ginella rounded out the top 10 of what was a rather elite young field of paddlers. FOURTH LAP: Connor continued his charge on lap four, holding onto his lead as Jake and Casper did everything they could to close it. Riggs pulled out at the end of lap three citing lower back problems. By the end of the fourth lap Jake did enough to close the gap on Connor once again, setting up a tense start to the final loop of the course. Casper was continuing his fine form from Saturday’s sprints (where he took third) to keep a slight distance on Mo Freitas and Zane Schweitzer. However an unlucky wave on the way into the final beach flag turn saw Mo overtake the Viking to move up into third. Zane was a little further back in 5th, with Kai Lenny having a day he’d probably rather forget, getting dropped a long way back into 6th and having to hold off the lower half of the top 10. FINAL LAP: Connor and Jake charged out the back for the final lap with a good 100 metre lead on their rivals, making it a two horse race. Connor had a lot on the line: Win this race and he’d wrap up the overall 2014 World Series title with one event still to go. By the halfway point of the final lap, Connor had gapped Jake once again, showing his slight superiority in the little downwind bumps. As they rounded the buoy for the final, upwind leg to the finish, Jake dug deep to close the gap. However every time the Aussie threatened, Connor seemed to find his magic, extra gear to pull an extra board length back out in front. It was a supreme fight from Jake, who showed he’s firmly entrenched on the top tier of the sport, but Connor just had that extra half a percent when it mattered most. Like Kelly Slater finding one his trademark buzzer beaters, Connor Baxter pulled away at the final buoy . The crowd cheered loudly (prompted by calls of “Can we have some crowd noise please?” that were picked up by the mics…) as Jake and Connor ground their way up the final 500 metres of the course. Mo and Casper fought bravely in 3rd/4th, but it was all Connor and Jake. Connor hit final turning buoy first, taking a slight edge into the final 100 metre sprint to the shore. Just as the guys were looking for a wave to surf to the finish, the ocean went flat, paddling practically the entire way to the sand. Connor managed to find the tiniest of bumps to draw clear though, hitting the beach five seconds ahead and jogging up the sand to claim the race win, the event win and the overall World Series title. After fighting hard the whole way, Casper had to settle for 4th place, with Mo Freitas claiming third. That gave Mo second overall for the event behind Connor, with Casper in third overall. Candice, Angie and Lina were battling it out for the first lap. Candice took off on lap #2 to create a solid gap by the halfway point of the five lap race. Angie and Lina battled hard together, however Candice clearly had the superior speed, power and wave knowledge. By the end of the third lap, Candice had extended her lead to put a stranglehold on the race. Lina held a slight edge ahead of Angie, with Fiona Wylde a solid ways back in fourth. Candice continued to extend her lead on the final lap, hammering the coffin shut as Angie and Lina battled for the runner-up position. The webcast focused on the much deeper men’s field, so we didn’t get to see most of the women’s battle, however Candice looked very strong out there. Lina pulled clear in the second half of the race, while Fiona mowed down Angie on the final part of the final lap. 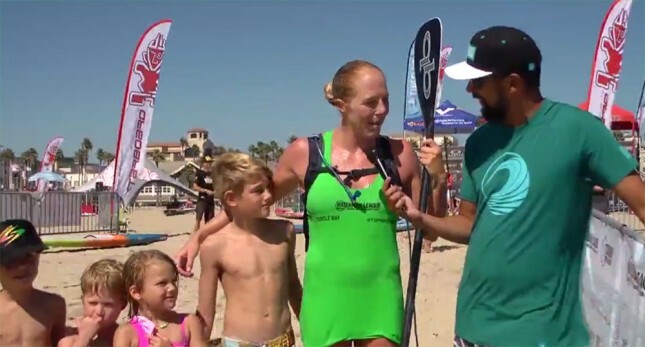 Early results from the racing portion of the Huntington Beach Pro. The event has drawn a very solid field in what should be an interesting warm-up for the Battle of the Paddle in two weeks time. Today it was the sprints while tomorrow it’s the distance race. Solid waves. Gnarly shorebreak. Looked like there was plenty of carnage. Early results below – full results when the organisers shoot them out. If you wanna see more, Jacko has about 100 pics up on Facebook already. Post by Stand Up World Series.